Palmer is a small town, just off Hwy # 3. The Mameyes River runs along it, so it is often called the town of 'Mameyes'. Recent years have seen many new tourist attractions, such as restaurants and gift shops. Tour buses enter the road #191 up into the north side of the rainforest though this town. 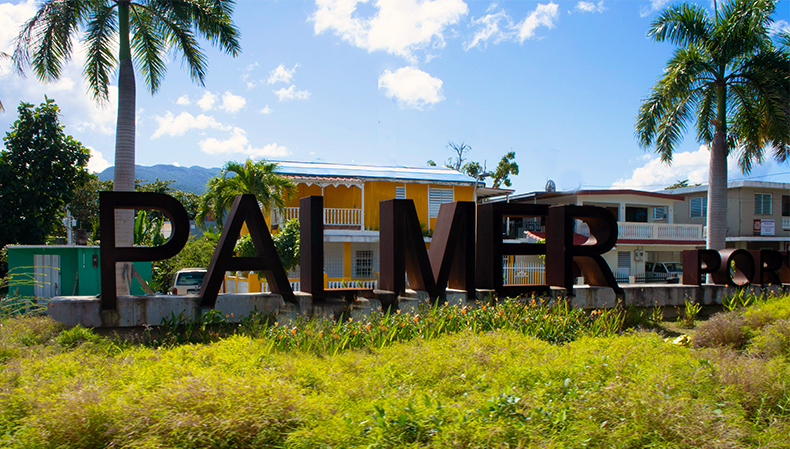 The El Yunque Visitors Center has set up an office in the town called 'El Portalito' which offers forest information, a gift shop and many talks by experts about the various aspects of the rainforest. Where to eat in Palmer, main road: Restaurant 18 Degrees North' fun, vegetarian, open air.. 'Lluvia' a little more upscale with nice desserts. 'Mi Vida' hamburgers and a good varied menu. and the Bakery next to the gas station, daily lunch special with local food. Peccas artisan Ice cream shop! TRADEWINDS is the sourvenir shop. • Sierra Palm Forest level of the forest, just below the dwarf forest. Walk through the Sierra Palms on your hike up to Mt. Britton. Cement path with occasional gazebos. • Dwarf Forest lies at the very top of the El Yunque rainforest. Plants are unique and survive the extreme rainfall and constant wind. • MT. Britton Tower is a favorite hiking trail with the tower destination and views over the mountains tops. 45 minutes up from the parking at the top of road #191. Sunny days you can see forever, cloudy days the clouds swirl around and below you! • Visitors Center The El Portal Visitors Center is closed at present due to damage by hurricane Maria.  Help the Rainforest various ecological threats and ways to help our environment. Coqui Frogs Photos and a little about the Coquis. Rainforest, biobays, scenic lighthouse views, kayaking, hang gliding, zip lining.